Connection: 1/4" NPT thread mount. Health & Beauty. Key Chains, Rings & Finders. Baby Kids Toys. Healthcare, Lab & Life Science. 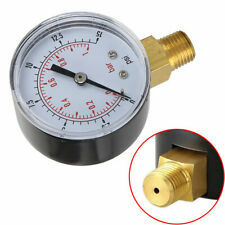 1 x Pressure Gauge. Wide applications: suitable for air, water, oil, air and other materials that are not corrosive to brass. Marshalltown canner gauge (0-30 inch Hg vacuum), tested, 1-year warranty. 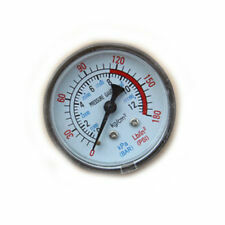 Air-pressure gauges give you the ability to read and record air pressure data from a variety of devices. These measurement devices can be used in personal or professional applications. Some air-pressure gauges might suit your needs better than others. 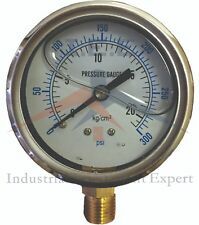 What are some applications for air-pressure gauges? Air-pressure measurement tools have wide-ranging applications. 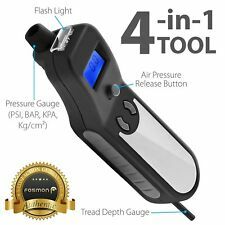 You can use them to monitor and measure air pressure with a variety of instruments and equipment. HVAC systems: Heating, ventilation, and air conditioning (HVAC) systems are responsible for maintaining comfortable internal conditions in commercial and personal buildings. HVAC systems use liquids and gases that need to be maintained at specific pressures, and pressure gauges give you a way to monitor those pressures. Air compressors: Power tools often use compressed air as an energy source, and compressors are the instruments that make this possible. Manufacturers design compressors to operate within specific ranges, and gauges can help you to monitor, adjust, and track those values. Tire-pressure readers: Vehicle tires can come in many shapes and sizes. Tire makers design their products for specific vehicles and road conditions, and they also recommend them for use at certain air pressures. 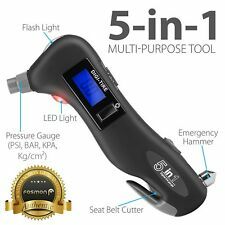 Tire gauges help drivers to keep their tire pressure at the proper levels. Vacuum chambers: Vacuum chambers need specialized gauges to register low-pressure readings. Pressure-testing equipment: Pressure-testing equipment can help test air-tight devices for structural integrity, and it can also help engineers and designers verify the strength of their products. 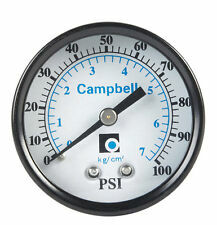 How should you select pressure gauges? Maximum pressure: Compressors put out a range of pressures that span from 15 pounds per square inch (psi) to over 1,000 psi. Face diameter: Compressor readouts often appear in dial form. Larger dials provide visibility of small graduation lines. Readout design: Digital and analog are the two main compressor readout designs. Analog readouts are the traditional dials with graduations, while digital readouts give users numerical representations of air pressure levels. You can find some air-pressure gauges that are backlit. Where can you mount air-pressure gauges? Fittings: Fittings appear at the joints of many devices and are possible locations for gauges. Manifolds: Air manifolds contain and route high-pressure gases, making them another possible testing location. Pipes and Tubes: You can use pressure sensors and gauges on gas pipes and tubes.